Rafael Domingo, Roman Law: An Introduction, Londres-New York, 2018. Roman Law: An Introduction offers a clear and accessible introduction to Roman law for students of any legal tradition. In the thousand years between the Law of the Twelve Tables and Justinian's massive Codification, the Romans developed the most sophisticated and comprehensive secular legal system of Antiquity, which remains at the heart of the civil law tradition of Europe, Latin America, and some countries of Asia and Africa. Roman lawyers created new legal concepts, ideas, rules, and mechanisms that most Western legal systems still apply. 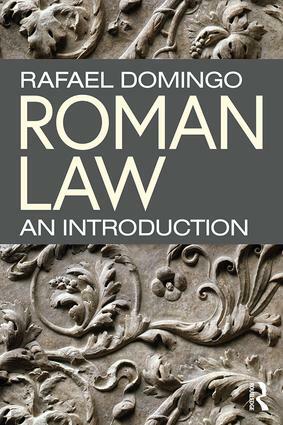 The study of Roman law thus facilitates understanding among people of different cultures by inspiring a kind of legal common sense and breadth of knowledge.